Saul Marquez: Welcome back to the podcast. Thanks so much for tuning in today I have a very special guest. His name is Dr. Emmanuel Fombu. He’s a global commercial strategy and digital innovation leader at Johnson and Johnson. Dr. Fombu is a recognized authority on the convergence of digital technologies and healthcare. He’s an award winning and best selling author, physician, keynote speaker, investor, entrepreneur, and medical futurist with over 10 years combined experience in clinical medicine, drug development, medical affairs, digital medicine, business development ,and licensing research pragmatic trials, and product lifecycle management strategy in biopharmaceutical industry and private equity. There is a ton that this leader is up to Manny’s current focus is on how the digital technologies can be leveraged to better measure healthcare related products, real world effectiveness and value. It’s something that we’re really kind of struggling to figure out and get on the same page on that value based care. And how can digital therapeutics and digital technologies deliver on that. He’s also very focused on being able to design more comprehensive disease management systems in partnerships with digital health startups, health systems payers, and providers. He’s done a ton here but what I want to do is welcome him first of all and then open up the mike for Manny to fill in the gaps of the introduction. So Dr. Fombu, Manny welcome to the podcast. Emmanuel Fombu: Thank you. Thanks for having me. Saul Marquez: It’s a true pleasure. Now what did I leave out in that intro that you want to share with the listeners? Emmanuel Fombu: Well I think you did a fantastic job with the intro but I think overall, I’m a physician that I’ve experienced working in a medical practice and then I have been in the industry in the field as a medical science ye ars on I’ve worked with the private equity side of it. I’ve been in the startup company talking to payers trying to get funding for a product. And I’ve also been on the big pharma side designing clinical studies and on the commercial side as well. So I feel like I’ve been around the industry and interactive the most of the stakeholders in this space. And that’s why I’m very passionate about bringing about change to make sure everyone has value. Saul Marquez: Love it, love it Manny. And why did you decide to get into the healthcare sector to begin with? Emmanuel Fombu: Well my family’s from a central African country known as Cameroon which Cameroon was named by the Portuguese who stands for. It was real. Those cameroos which means river of cods as well as seafood in my country. Emmanuel Fombu: So growing up, there are only two options in life either became a doctor or became a lawyer. So those are the faults but over time as I grew up I was always fascinated by the idea of solving problems right. And naturally I fell into biology. I wasn’t necessarily like the greatest math student or the best chemistry student but I was like biology because I felt like there was this mystery that had to be solved so I especially about that history literature. But then over time I went to college and ended up in the medical school. And at that time my grandmother got sick and she had heart failure. And I got really driven towards cardiology and heart failure because I didn’t want other people to go through what my grandmother went through with heart failure close to me. So I ended up doing a specialty in heart failure and that led me into another amazing world. And I’m here today. Saul Marquez: Man that’s awesome. What a great sort of meandering road. Driven by passion and sort of the things that you value most, your family. So now you’re here, share with us what you believe Manny is a hot topic that needs to be on every medical leaders agenda and how you’re approaching it? Emmanuel Fombu: Predictive Medicine. In the industry right no, you hear a lot of people talk about artificial intelligence, machine learning and all those buzzwords right and people… when I watch, I mean if I read comments on LinkedIn or auto forums, everyone is talking about is it A.I real is what’s in real notice. And I think everyone is missing the big picture. The big picture here is technology enables us to create a new form of medicine known as predictive medicine. When I say predictive medicine what do I mean? predictive medicine to me is the field of medicine that focuses on predicting the probability of disease instituting preventive measures in order to either prevent the disease altogether. But if someone has a disease, how could we significantly decrease its impact on that patient? Right. And so to me that’s the best description of value based healthcare. We talk about it so let’s let’s put the costs and everything else on the side. But predictive medicine I think is the future of healthcare and that’s where we need to focus on. Saul Marquez: Love it. Love the simplicity there and I really like that you highlighted both, “okay, you know there’s a segment of the population with chronic diseases and conditions that we need to manage. Quality of Life Matters.” And then those people that shouldn’t be getting sick that are getting sick to begin with. So we’d love to hear from you trying from some of your experiences or ideas on things that you’ve done to create results by doing things differently. Emmanuel Fombu: So one of the things I’m very proud about in my career is working on a particular study in heart failure and the idea was to monitor patients remotely using devices like a physical activity to objectively capture a quality of life. Right. And so you know in industry today what would depend on to determine patient quality of life is using questionnaires right which are based on recall. So you could ask a patient “how did you feel two weeks ago?” right. “Did you have more activity two weeks ago?” Well I couldn’t tell you that what my activity was three days ago right. And so I think this leads to the idea of the sort of bias that comes into these answers. Think about disease in general, why does someone take any medication or why does when someone is sick, what is the best thing that they want? They want to feel better. That’s what you feel like, right? Emmanuel Fombu: People sleep at home. So we actually use the home sleep test which is another challenge doing that. We felt that was very convenient for the patient. We wanted to capture as much data as possible and we will set it. And so we successfully as a kid that study and we published a metal paper on that. And I think was fantastic on how we did it was very big job by the team and what we learned from this is for the data that we collected we were able to then build predictive models that perfectly fits into this idea of predictive medicine where we could actually say hey you as an individual patient you look at your activity levels or your lifestyle from baseline and change from baseline. We need to intervene to find out why that changes right and if there’s something wrong that we should intervene ahead of time so that to me that’s a very good project. Saul Marquez: And that is a great project. So you guys did a home sleep test. How about wearables? I mean what are your thoughts on collecting data through wearables? Saul Marquez: Oh it was part of it? Emmanuel Fombu: Yes yes we did. So we tracked daytime activity using activegraphy and we’ll use a different device to look at sleep. Saul Marquez: Nice very, cool very cool. I love it man and you call that right. I know a couple months ago I had a gentleman on my podcast who was in a bad accident, lost his memory his short term memory so he can’t really remember things and he started this company called Me.mory and one of the things that he mentioned is that the unfortunate thing is that he lost his memory. But the fortunate thing is that he lost his memory because now he could remember things that I probably or you can’t remember because there’s just no way like you said or I remember how I felt like three days ago. Saul Marquez: And this wearables thing is really like you know to your point is going to be what helps us make these predictive medical decisions. Emmanuel Fombu: Now this is getting fascinating. Saul Marquez: It’s amazing. Hey what do you think of CES. I hear it’s becoming more and more healthcare focused. Emmanuel Fombu: It’s incredible. I spent two days in Las Vegas with CES and the first day, I spent four hours down going down just one aisle. Emmanuel Fombu: Yeah. The second day, I tried going through the second aisle and barely made it right. Emmanuel Fombu: But the interesting thing about this is when I was good to CES I add one particular vision company that wanted to see, I was more interested in the idea of smart toilets which is very weird. Saul Marquez: No I mean no it’s kind of interesting I guess in a lot of ways. But I want to hear your take. Emmanuel Fombu: Correct. So I thought like one of the best ways to collect samples for testing is through the toilet. Right. Emmanuel Fombu: You know everyday people you know has urine, you wake up in the morning most people go to the bathroom so there’s a lot of samples and testing that you could actually track. Right. That is more internal. They cannot be tracked by wearable. Correct. And so I was fascinated, I was curios, if what was happening the consumer world if anyone was trying to leverage that or do something about it. So there’s a company that had like a smart toilet so I tracked them down on my second day finally I met with them and to my big disappointment they were not thinking about that in the US market. He mentioned that they would do something like this in Japan like was a missionary thing. And people tend to laugh about it but then I realize maybe we need to bring more focus into this and say hey think about it when you go to your doctor’s For example let’s say you have to do urine tests. You have to get up there you know you can pee all day. You have to go to rub core quest. You have to sit there with your doctor’s office. That’s a good cop go into a room and then pee and then well that you could just. Which could just feel at home. Yes. The samples. So I think we need to start shying away from such things and actually see how we could incorporate things that they get out we all need to go to doctor’s office and this should get health care. Health care is part of our lives. Right. So whatever we are we should be able to be involved in health. Saul Marquez: Love it. And folks CES is the consumer electronics meeting and the cool thing about this and I think the reason why it is becoming more healthcare focus is because healthcare is becoming more consumerist. You got to start thinking outside the box here. If you’re a provider and even as as device and pharma companies you really have to start thinking more from a consumer perspective, Manny brings up some great examples like the E toilet. I mean that’s a fabulous way to think outside the box. So can you share with the listeners a time when you had a setback Manny and what you learned from i? How did it make you better? Emmanuel Fombu: I’ve had multiple setbacks and that’s it. So I think all of them around uncertainty. So a lot of times people like myself, yourself, and lots of other people industry or patients and everyone else you hear this word go patient centricity. Right. And bieng in the industry the most frustrating piece for me is you have tons and tons of clinicians and scientists and everyone that worked for pharma companies, device companies, about tech companies the best minds are in there. But because of regulations and everything else somehow they cannot interact with the patient which I believe is the end consumer. And overall we end up having like this negative connotation about big pharma always big biotech or whatever it is. So a lot of times we’re being in concepts. I feel every time I don’t have a patient’s voice involved in the development of any particular product what is this clinical study or any campaigns that we do. I consider that a failure. So its my personal goal to make sure that patients are more incorporated into our discussions to make sure that we actually build the products that I get to what’s our consumer. Saul Marquez: I think it’s a really important point that you’re making. And just the whole idea of patient centricity it’s kind of silly isn’t it? Emmanuel Fombu: It is very silly. Saul Marquez: What we do I mean say come on now. Emmanuel Fombu: I’ll tell you a hilarious hilarious. I did a piano about thinking about a year ago in Philadelphia for things that I for pharma meeting. And I think that the topic of the panelist was how could industry become more patient centric. And everyone was going around the table. We had people from Amgen, from Eli Lilly, from the what is everyone else right to bear. And they had this patient centric people. That was a job right. And so their talking about how we were becoming more patient centric and when you got to me and I said I’m embarrassed that we are sitting here having this conversation about business interests. What else are we doing right? What else. I don’t know the real topics or their buzzwords. People get excited about. Because when I wake up and I go to work every single day I’ll tell you the first thing that comes to my mind is how do we change the life of the patient. That’s what matters to me and I’m sure that’s what matters to you and everyone else. Saul Marquez: Absolutely. Now that’s great man, glad you’re bringing that up and so you’ve had a pretty cool career you’ve done a lot of really impactful work. What would you say out of all the work you’ve done as one of the most proudest things that stands out? Saul Marquez: What’s the turnaround time? Emmanuel Fombu: Which is way better than I mean I wish we could get it at a point of care. That would be much better as the next level. Saul Marquez: That would be. Yeah tha’ll be the next step but 40 hours is still really good. Emmanuel Fombu: Correct. And the test was run by robots. Right. So we have robots running the test and we had coverage around the country and the test is out there and people benefited from this. Right. So to me that was a great idea. How do you cut down costs? A big value to the consumer is fantastic. Saul Marquez: What a great example for sharing and how about now. What’s what’s an exciting project or focus you’re working on? Emmanuel Fombu: I’ll tell you what I’ve learned that’s fascinating me right now is the concept of human behavior. Right. Tell me more. I’ve spent a lot of my career around cardiovascular disease looking at like heart failure or hypertension and everything else. But I always had this view from a physiological perspective and I realized from speaking to patients and for working that space recently that you could send all the alerts and everything you want to someone but you have to look at that person as a whole. Right. If you look at the ideal predictive medicine, the idea is to understand what happens to that person and how do you change their behavior. And I will give you a good example. If you had been to San Luis Missouri there’s a street there called Delma Boulevard and this whole concept under Delma de Bay where the northern part of the city basically has low and low income part of the city right. Less educated people. Home values are lower and they have less access to healthcare. Right. And that comes along if you have been to any neighborhood like they’ve got out of Baltimore. Right. Washington D.C. those are areas I lived in right. Saul Marquez: Yeah Chicago where I live is like that. Emmanuel Fombu: Correct. Right. It’s also Chicago. Other places if you look around those areas you find out if you go to Baltimore as a good example, it’s a liquor store in every other block. You have fast food restaurants selling junk in every other corner. The fried chicken places everything is the liquor store everything. That’s what’s in those neighborhoods right. If you look at the risk the rates of cancer in the northern part of the Delmar Boulevard and decided imply which is more educated, more prevalent, more affluent, you’ll find out the rates of heart disease lung cancer are five times higher in the lower part than the southern part of this exact same city. And this more two things that we have to do right, there’s more to behavior and behavior comes along with your environment. So as we look at. Correct. And so as we focus on looking at genetics of medicine and we look at physiological parameters and we look at everything else we want to look at from a scientific perspective, it’s very important to look at environmental situations so look at behavior or things. How can we change patients behavior and how can we make that environment much better? Saul Marquez: Yeah I think it’s a great call out man and kind of spans into how can we work alongside public health experts to work on solutions for population health in general. Emmanuel Fombu: Yeah correct. This is real. If we look at cost would there be value based healthcare I start our discussion today. Right. If you look at value based healthcare, if you look at the people that cost the most of a healthcare system they’re not people that live in Palo Alto. People I live in Cambridge. Right. That’s not where the most health care costs come from. But a lot of times, how often do we actually step foot into where the patients live. Well when I see patients I’m talking about features that could travel to us for us to engage with. How much time do we spend in those communities where the patients don’t have access. Right. Because I think a lot of CES are talking about this now in pharma. Right. Like vast from what we think it’s just a public information. Talk about the biggest challenge for 2019 going forward is that it’s access. Emmanuel Fombu: That’s right the science is there, the drugs, the devices said to keep patients living but no one has… the problem is universal access. People don’t have access to these things right. So that’s what we should focus on access to me. That is a big big big thing now. Saul Marquez: Love it. And you know it starts with the station it starts with the project just starting is the key. Execution is what leads to solving these problems. I’m glad you’re working on it Manny. Working toward the end of our time here, time flies when you’re having fun. This part of the podcast is a lightning round so it’s gonna be quick answer, quick question. The one on one of Dr. Manny Fombu on healthcare outcomes and so I’ve got five questions for you followed by a book, you ready? Emmanuel Fombu: Listen to the patients or the consumers. And what you design your products. Emmanuel Fombu: Not listening. Making none data driven decisions. Emmanuel Fombu: You have to keep up with the times. Otherwise you’ll be left behind. Saul Marquez: What is one area of focus that drives everything in your company. 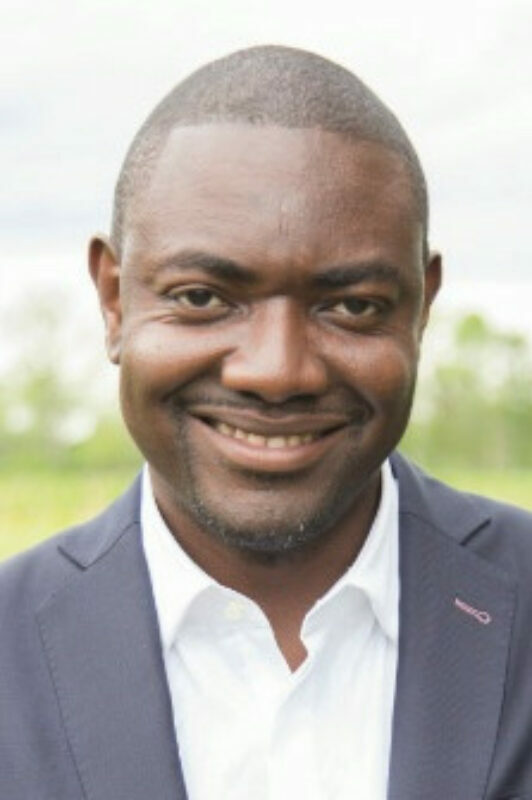 Emmanuel Fombu: People, as in people and culture. Saul Marquez: Finally the last question is actually a two part question. What is your number one health habit and what is your number one success habit? Emmanuel Fombu: My number one health habit is trying to eat more veggies. Saul Marquez: Love it, it’s okay to have it. Emmanuel Fombu: Trying, I ‘m trying. And was the next question? Saul Marquez: And then number one success habit. Emmanuel Fombu: Number one success habit is being open and engaging with my cross-functional partners at work. Saul Marquez: Love it. And what book would you recommend to the listeners? Emmanuel Fombu: Just one or two? Saul Marquez: You could have two if you have a burning desire for two then let’s go with two. Saul Marquez: Here’s your chance for some self promotion. Emmanuel Fombu: Sure. My book is called The Future of Healthcare: Humans and Machines Partnering for Better Outcomes. So that’s separate but personally there are two fascinating books that I’ve read and I’m rereading currently. The first one is called Prediction Machines: The Simple Economics of Artificial Intelligence written by Joshua Gans and Avi Goldfarb and Ajay Agrawal, it’s a fascinating book..,. Emmanuel Fombu: Because what I love most about this book is it goes deeply into artificial intelligence and explains the whole concept of predictive medicine but related to everything else in life right. It’s a fascinating book and the last book I recommend is 21 Lessons for the 21st Century by Noah Harari. He also wrote Sapiens but those two books are fascinating. Saul Marquez: Yeah yeah yeah. Excellent. Hey, we had Ajay Agrawal on the podcast several months ago. Saul Marquez: Yeah. Yeah. Prediction Machines I’ll have to add it to the list. And Sapiens is a good one. Great one. I didn’t know about 21 you said 21 Lessons? Emmanuel Fombu: 21 Lessons for The 21st Century. It came out about two months ago so that’s his third one. That’s because he did Sapiens, he did Homo Deus. Emmanuel Fombu: The third one is this one’s fantastic book. Saul Marquez: There you have it and listeners. I know I’ve added it to my list but Prediction Machines, 21 Lessons for the 21st Century and also of course will include a link to Dr Fombu’s book that he wrote. Listeners, please remember to get all of the details. Links to these books. A full transcript of our discussion. Just go to outcomesrocket.health in the search bar, type in manny fombu and you’ll find the entire episode there before we conclude Manny, I’d love if you could just share a closing thought and then the best place where the listeners could get in touch or follow your work. Emmanuel Fombu: Correct. So my final thought would be that foglessness might end for myself included we need to stop looking at health where we say health we think about sickness right. We need to look at health as a way of being as a lifestyle as opposed to looking at people, your patient as you are sick and we focus on managing disease as opposed to just managing lights right. We are all patients. We are all consumers and we are all humans. So let’s look at it that way and I think that stigma will disappear and we will live happy lives. Saul Marquez: Beautiful closing thought my friend. And what would you say the best place for folks to reach out to you or follow you is? Emmanuel Fombu: Perfect. So the best place to reach me you can reach me on LinkedIn on the Emmanuel Fombu or you can also go to my website. I have a website is emmanuelfombu.com. Saul Marquez: Outstanding and we’ll provide links to that in the show notes, folks so be sure to check that at outcomesrocket.health and Manny just a final thank you for joining us today it’s really a fun discussion. Emmanuel Fombu: Thank you I appreciate it. The above audio transcript of “Humans and Machines Partnering for Better Outcomes with Emmanuel Fombu, Global Commercial Strategy and Digital Innovation at Johnson & Johnson” was transcribed by the best audio transcription service called Sonix. If you have to convert audio to text in 2019, then you should try Sonix. Transcribing audio files is painful. Sonix makes it fast, easy, and affordable. I love using Sonix to transcribe my audio files.